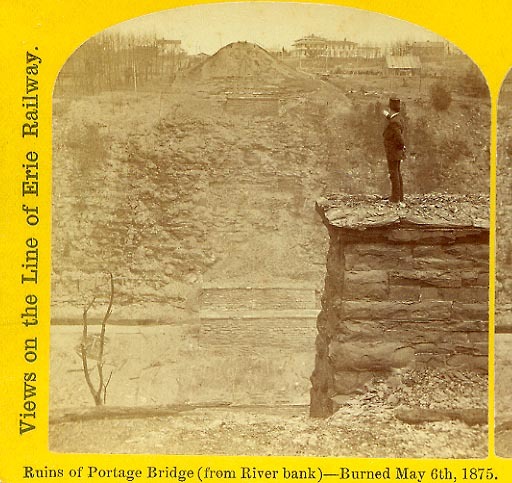 "Ruins of Portage Bridge (from River bank)- Burned May 6th, 1875. The Portage Bridge was destroyed in May of 1875. (see account) For the first time in over twenty years no great wooden towers cast their shadows on the cliff walls above the Upper Fall of the Genesee. A man is posed on one of the stone supports that once held the Bridge. He points east toward the empty embankment that once supported the Erie Railroad Tracks. To the right of the mound in the famous Cascade House. The gorge would not be empty for long - soon new iron towers would rise in the gorge!